On Giving Yourself a Break: or, You are a man, not God! 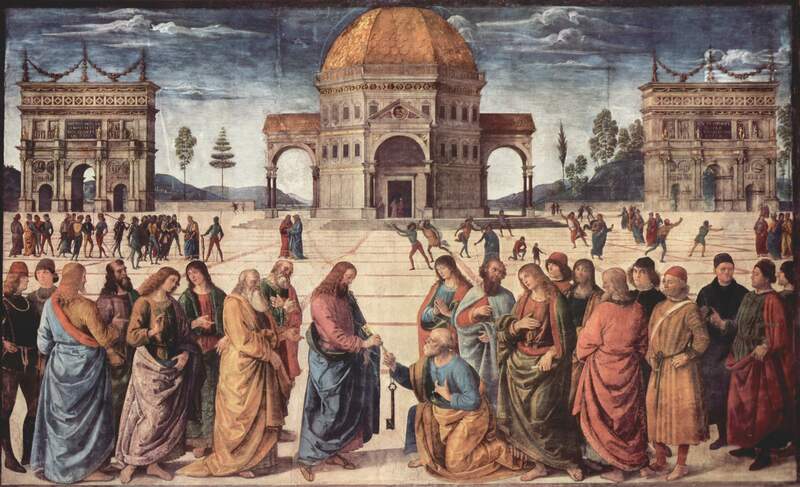 Entrega de las llaves a San Pedro (The Delivery of the Keys to Saint Peter). Fresco, Sistine Chapel, by Pietro Perugino, c. 1481. Public Domain via Wikimedia. ...imitate His life and habits, if we wish to be truly enlightened and free from all blindness of heart. If you attend to God and yourself, you will little be disturbed by what you see about you. You are a man, not God. You are flesh, not an angel. I found this work mesmerising, enlightening, beautiful. Have I found the answer to Benjamin Franklin's riddle? Well, not quite. Franklin has a number of other riddles that will require a reading of Aristotle's Ethics, and there is more to be gleaned from St. Teresa of Ávila's Interior Castle. Yet I can feel that I am nearing an understanding. Of course, Mortimer Adler would say that if I cannot explain it, then I do not understand. Thankfully, Kempis tells me that I am a man, not God, so I can give myself a break. But I am glad that I took Alder's advice and I have started making notes in the margins of my books (in pencil only! ), for I shall be returning to this book again and again and it will sit with my copy of Benjamin Franklin's Autobiography for ready reference.